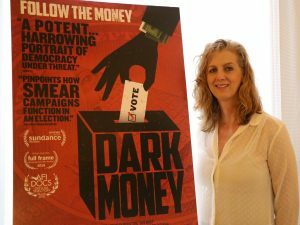 I met with director Kimberly Reed (no relation) on Thursday, June 14, 2018, at AFI DOCS, to discuss her feature documentary Dark Money (which I also reviewed). In the film, Reed discusses the many ways in which money distorts politics, particularly in her home state of Montana. 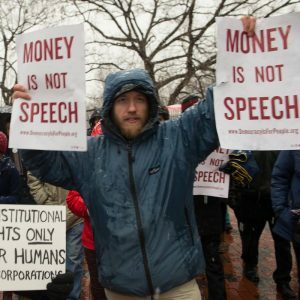 There, elected officials, as well as potential candidates – from both major parties – face the disastrous consequences of the United States Supreme Court’s misguided 2010 Citizens United v. Federal Election Commission decision, which allowed corporations to donate unlimited funds to political campaigns. Despite Montana’s local laws, born out of its own history of corporate malfeasance, the state struggles to keep its elections uncorrupted by those who would purchase the levers of power. Dark Money tells a disturbing and vital tale of this ongoing crisis of our erstwhile democracy, and hard as it is to watch, must be seen by all. Here is a condensed digest of our conversation, edited for length and clarity. HtN:…how familiar were you with the issues discussed in your film before you started making it? KR: That’s a really good question, because so many of the issues in the film were created by the 2010 Supreme Court decision, Citizens United, but when you grow up in Montana, as I did, I think you’re inculcated with this sensitivity to money and politics. By that I mean that Montana has a long history of being a state where there’s tons of natural resources and not a lot of people. And so, for as long as Montana has been a state, rich people from outside have come in to extract resources and then leave Montanans to clean up after them. I remember going to grade school and hearing stories about the “Copper Kings,” these magnates who were fighting over what were known at the time as the richest hills on earth, in Butte, Montana, and how they were all vying for control of the entire state. And when I say the “state,” I mean that they owned the newspapers, they openly and brazenly bribed politicians, and they controlled the company town: you worked for them, you paid your rent to them, and they were in charge. And I think that with hearing all those stories, and driving through Montana, which is 99% just gorgeous, and then running into some of the environmental mistakes that happen when that exploitation is not taken care of, gives you a healthy skepticism about corporate development and money in politics. HtN: A healthy skepticism that far too many people do not seem to share, at times. So, I have a related question: with how many of the people who are in your film did you already have a connection? Is there anyone that you already knew well before you started filming? KR:…who is now the Governor of Montana, yes! In 2012, he was AG, and he was taking a case to the U.S. Supreme Court that had the ability to overturn Citizens United. So, knowing him, I said, “Let me follow you. This is a story. This is like ‘Mr. Bullock Goes to Washington. '” I was wrong about that. (laughs). He was not successful in overturning Citizens United, but what that did was become a springboard sending me back to Montana to really dig into the subject. And what I thought was going to take a couple of months took five years of shooting. In doing so, I realized that when Citizens United passed, everyone was talking about the problem being unlimited money, and what I really found in Montana was that it wasn’t just the unlimited money, it was the anonymous money. That was really the nefarious and ultimately damaging loophole that was being exploited there, and was exploited there first. It was apparent that Montana was really the battleground for all these issues, and it was going to become a flashpoint for a lot of these debates, which is always what you’re looking for when you’re developing a film. I knew I had access to people since I had grown up there and knew how to talk the talk, and I knew that it was something I could play the long game on. HtN: Where did that connection to Steve Bullock come from? It’s very serendipitous! HtN: You went to high school together? Wow! KR: Yeah. He was older than me. HtN: That’s great! So, to me, an East Coast liberal, a state like Montana – which I visited once and thought was beautiful – has always struck me as a bastion of conservative and libertarian values. I don’t pretend to know much about what it’s like on the inside. I was surprised to see, however, the bipartisan response there to the issue of dark money. Am I just misguided about the state? After all, you have, now, a Democratic Governor, who has made this a signature issue. How would you describe the politics of the state? But, yeah, it’s a little hard to explain. We were just talking about the history a moment ago, and a lot of the early-1900s progressive movements actually started in Butte, Montana! (laughs) This is where a lot of the early labor and union movements started, because they were being exploited when a bunch of rich people came in and ran the mines. You know, that same old story. I think that what you find a lot, in the Rocky Mountain west, is this kind of “you leave me along, I’ll leave you alone” attitude, which sometimes is hard to interpret from the coasts. HtN: Although my New England family shares some of that. I think you do find that as you go up that coast. KR: You do, and I think it has something to do with the geography. Let’s put it this way: when someone’s pulling your car out of a ditch, you don’t care if they’re a Republican or a Democrat. When a neighbor’s house is on fire, you need to have a sense of community that is going to span those political borders, so that you can depend on each other. And so, I think when you go to Vermont and New Hampshire and Maine, and Wisconsin and all of these places that go back and forth a little bit, or don’t really follow along these easily defined political lines, you see that all the time. The way that you develop a sense of community helps you overlook some of that stuff. HtN: So, your film is really beautifully shot, even some of the really sad footage, like that lake that’s super acidic, where the geese die. You were one of the cinematographers. Do you do a lot of shooting, in general, or is this something unusual for you? KR: I do a lot of shooting, in general. I shot a lot of the interviews, here. That aerial photography, which is some of the most beautiful stuff, is something that we got towards the end of production, shot by this guy name Eric Phillips-Horst, so anything that is sort of hovering over the world, shot by a drone, is his stuff. HtN: That footage is really beautiful, even though sad. That story with the geese breaks my heart. HtN: This is not your first documentary. Were there any challenges specific to this film, either with getting people to be on camera or with obtaining access to certain areas in which to film? KR: I tried many times to get [Montana State Legislator] Art Wittich on camera. HtN: And he is the person who ends up being tried and…is he convicted? KR: It’s a civil conviction. HtN: That’s right, and then he loses the subsequent election. KR: Yes. He was found to have violated campaign-finance laws and was fined. I think it was the biggest fine up until then for a sitting official, and then he lost his re-election campaign. So, yeah, I would have liked to have discussed these issues with him. Not having that interview, the challenge became how do we present his side of the argument anyway, with the footage that we had. The film ends up in courtroom trial, where he is the defendant, and so we could articulate a little bit of his argument, just by showing that. HtN: Yes! You have that guy to represent the point of view that Art Wittich basically shares. So, you do have that in the film. Now, as your film starts to roll out, since it directly challenges some of what is happening in our country right now, have you experienced any pushback, either within Montana or without, about the nature of your subject? KR: Things are going really smoothly. We were lucky enough to be the opening film at the Big Sky Documentary Film Festival, which was kind of a homecoming, and it was great! We had a bipartisan group of people sitting on the stage with us to discuss the impact of the movie, including some of the subjects of the film. It was a great screening, in the middle of a snowstorm, too. HtN: Final question: how would you describe the state of politics within Montana today? Do you think the forces of campaign-finance reform are winning the battle? After all, the law of the land is still Citizens United, but Bullock is, for now, Governor. So, how are things in Montana? KR: To answer that question, you have to look at it on two different levels. Within Montana – within the state elections – they have really cleaned up a lot of the politics. Voters know what dark money is. Voters vote on that issue. And if one candidate is seen as being aligned with dark-money groups and is not playing by the rules, that really works against the candidate, instead of helping them. And I think that in most other states that would probably help a candidate, to take secret funds and attack people in the dark of night and blitz them with these last-minute mailers or unsubstantiated ads. You know, most of the time that helps! That’s why people do it. But the script really got flipped in Montana, and that is no longer a helpful thing to be associated with these groups. And I think the regulations that were passed in 2015 – that you see in the film – by the Montana State Legislature, called the Disclose Act, that mandate greater disclosure, really help. There was active enforcement, particularly by Jonathan Motl, the Commissioner of Political Practices there, and there was a really healthy press, for a long time, that was covering these issues. So, when you have rules and they’re enforced and the press is talking about this stuff, you can actually choose the political culture and you can keep elections clean. HtN: And he’s a Democrat. KR:…and he’s a Democrat, and he’s sort of fighting for his political life in an election that Democrats see as absolutely crucial if they’re going to take over control of the Senate. And what you’re seeing there is kind of the same old story, because Citizens United is the law of the land, because his election takes place under the federal laws and not the state laws, he’s already getting slammed with tons of dark money. There’s probably going to be much more spent this election cycle than last, more it is probably going to be dark, but it’s interesting, because even though that is the law of the land and he can be hit with all this dark money, voters know what it is and they’re paying attention to it in a different way. So, it’s going to be interesting to see how effective it is. They can’t change those regulations because Citizens United rules federal elections, but having voters that are really looking at it and seeing all this dark money spent and being really disgusted by it, I think that his opponent may find that it works against him. HtN: Well, I’ll be paying even more attention now that I’ve seen your film. So, congratulations. I really enjoyed it. KR: Thank you very much!